Lavender and Yellow these are such lovely zingy colours to work with even for someone like me who is usually more comfortable working with girly pastel shades. So the lovely Diane is hosting this challenge and the sponsors are Sweet Lilac Flowers and Freshly Brewed Designs. I went back to an all time favourite stamp Indigoblu's Summer Lovin' stamp, it is so lovely to work with, it's a collage stamp so I stamped it several times using Stazon Royal Purple. Then I set about making my background paper ... a plain piece of white card can easily be transformed into a background paper. I used Squeezed Lemon distress ink and a blending tool for my base colour, then using Milled Lavender distress ink (second generation ... stamped first onto a scrap of paper to give a fainter image) I used unmounted stamps, without a block ... (Indigoblu, script and mesh) randomly to form background ... then using the collage stamp again I stamped random section of the stamp using slightly darker Dusky Concorde distress ink. I decoupaged some of the flowers on the main image and then used the rest of the flowers together with some diecut swirls to embellish my card. I was quite pleased with the result and I know a person who would appreciate these zingy colours on her birthday card. Right it's lunchtime and Husband has kindly made us a snack so I better not keep the chef waiting. Please enter this challenge it's so easy to do ... more details here then the fussy and fancy girls can get to view your blog and email entries. As the winners are randomly chosen it is very fair whether you are a beginner or an experienced crafter you have an equal chance of being a winner. 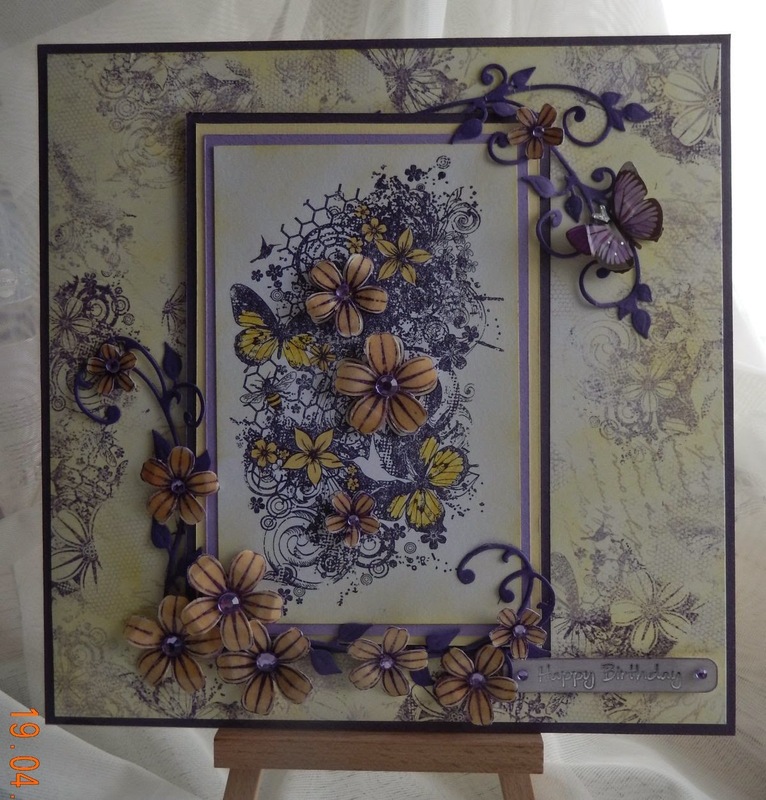 Beautifully created card Annie...I love the beautiful stamps you have used and the gorgeous flowers...a stunning card!! Hi Annie!! OMGoodness this is GORGEOUS...what a beautiful image and I love the way that you added the decoupaged flowers for that extra POP factor!! Hope that you are well...enjoy your weekend!! Annie! This card is absolutely outstanding!! I love that you decoupage do the flowers! You do such gorgeous work! You created a stunning labor of love! Imagine the look of joy when somebody special receives this card! They will want to frame it for sure! !